A Notice of Commencement is a form executed by a land owner or lessee before the start of any actual physical improvement to real property. The owner or lessee contracting for the improvements must record a Notice of Commencement in the office of the register of deeds for each county in which the real property to be improved is located. M.C.L. 570.1108(1). Recording a Notice of Commencement also starts the clock ticking for the contractor, subcontractor, or supplier to file his or her Notice of Furnishing. The notice of commencement must contain the following information: (1) the legal description of the real property on which the improvement is to be made; (2) the name, address, and capacity of the owner or lessee of the real property contracting for the improvement; (3) the name and address of the fee owner of the real property, if the person contracting for the improvement is a land contract vendee or lessee; (4) the name and address of the owner's or lessee's designee; and (5) the name and address of the general contractor, if any. M.C.L. 570.1108(2). Even if parts of the Notice are inaccurate, any incorrect information contained in the Notice of Commencement furnished by or for an owner or lessee will not harmfully affect the rights of a lien claimant as against the property of that owner or lessee. M.C.L. 570.1108(4). As a property owner, lessee, or designee, you also have a responsibility to provide a copy of the Notice of Commencement, together with an attached blank Notice of Furnishing form, to the subcontractor, supplier, or laborer requesting a copy of the Notice of Commencement within 10 days after the date of mailing of a written request by certified mail from a subcontractor, supplier, or laborer. M.C.L. 570.1108(5). The Notice should also be posted on the actual jobsite. 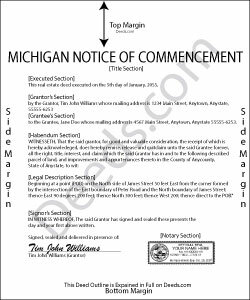 The owner, lessee, or designee must post and keep posted a copy of the notice of commencement in a conspicuous place on the real property described in the notice during the actual physical improvement to the real property. M.C.L. 570.1108(6). As a reminder, this article is posted for informational purposes only and should not be relied upon as a substitute for the advice of an attorney. Please contact a Michigan-licensed attorney with questions about the Notice of Commencement or any other issue related to liens.